· Special brackets are brackets which are completely treated as external tags. You can add and remove items. In the Special external tags frame, tags which need special treatment can be defined. To add items, enter a tag name in the text box below the list and click the Add button. To remove items, select one item in the list and click the Remove button. In the Internal tags frame, all tags which are treated as internal tags are defined. To add items, enter a tag name in the text box below the list and click the Add button. To remove items, select one item in the list and click the Remove button. In the Attributes to be translated frame, all attributes whose content needs to be translated are defined. To add items, enter a tag name in the text box below the list and click the Add button. To remove items, select one item in the list and click the Remove button. 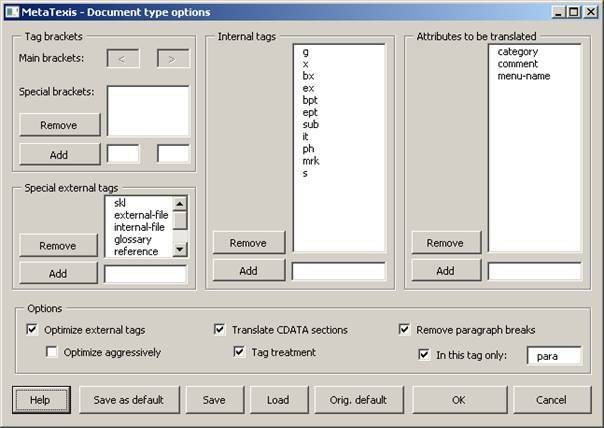 · Activate Translate CDATA sections when the CDATA sections should be handled as text (usually the CDATA sections contain strings that do not need to be translated). If the CDATA sections contain tagged text that should be treated like normally tagged text, tick Tag treatment. · Activate Remove paragraph breaks to remove paragraph breaks. This is important when the document contains many page breaks resulting in inconvenient segmentation of the text. To restrict this feature to a special paragraph tag, tick the In this tag only option and define the tag name (default value is "para"). · To load the original default settings, click the Orig. default button.